Sleeping On-The-Go: Sounds Like Fun! Nowadays, people got a lot going on that they often sacrifice some of the finer things in life to get as many things as they want to be done in the limited period of time that they have. It means having to go to places at odd hours of the day and night without thinking how tired their bodies must be. The dangers of sleeping on-the-go are the highest when you drive your own vehicles but it does not mean doing it while on public transport is any safer. 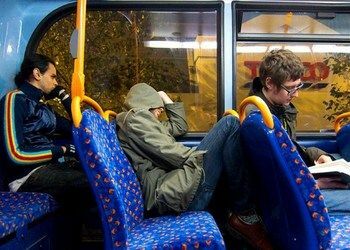 Of course, there are other people that are total strangers riding with you and you can’t always count on them to be honest and trustworthy especially once you fall asleep and you can’t keep track of your personal belongings. What’s even more important is your level of comfort when aboard these vehicles. We have seen our fair share of crazy trends circulating the market these days that nothing surprises us anymore. Some innovations may be so mind-blowing while others are just plain attempting to making our lives better and easier although we aren’t always successful in doing that. This time, a bus with built-in beds is something we can all be thankful for especially for those traveling at night or for longer distances. You can finally get that well-deserved rest even before you get to your home. Tired people could soon be ferried home at the end of the day on a bus fitted with beds. Passengers on the vehicle, which designers hope will eventually operate on eight routes across four UK cities in Autumn 2018, will be able to sleep off their excesses in 14 discreet futuristic pods. They won’t have to worry about missing their stop because stewards will be on hand to wake them up before they reach their destination. The bus has been in development for four months, with Surrey-based Andersson-Wood architects working on its design. It is also impossible for you to miss your stop as there are designated stewards to wake you up once you reach your destination so you get down at the right place while still feeling refreshed at the same time. Many people today work longer hours. They leave the house earlier and get home later because of the demands of work and school, not to mention the long hours they spend while traveling that can eat up a big chunk of their day. Those who work in shifts suffer the most as they have different work schedules that can consequently affect the way they sleep. It is why many of us end up sleep deprived since 24 hours a day is no longer enough to let us finish all of our tasks and perhaps many in the UK are now rejoicing why a bus with beds is heaven-sent we didn’t know we needed until now. There’ll also be blackout blinds, sound isolating systems and melatonin-promoting amber lights. The mattress-maker is also in talks with a food delivery service to provide an advanced on-board system that will cleverly track your route, so you and your takeaway arrive home at the same time. Unlimited free mineral water, with coffee and specially-selected smoothies will also be available on board, with individual revitalizer kits containing Vitamin C and liver-cleansing Milk Thistle. It even has a name. The “Snoozeliner” perfectly describes what it is. Only UK residents on 4 key cities can ride this innovative wheels and hopefully offer relief to those who always seem to be lacking in sleep. Late night travels won’t be as troublesome anymore and you can sleep in peace and comfort as you close the gap from point A to point B in sheer comfort. Everything about it screams state-of-the-art and it can easily be seen in every little detail about the bus. Everything is well thought out and addresses most of your common concerns and its makers are hopeful it can solve the sleep and travel problems of the 94% of British workers who admitted to having slept at one point or another on their way to or from work. While the Snoozeliner only addresses issues pertaining to sleep comfort, it can’t do much for more serious sleeping disorders like sleep apnea. If you suffer from one, it’s better to consult a doctor for proper medical management. A more convenient antis-snoring mouthpiece can do a lot of wonders to help with sleep and minimize its associated health threats. https://snoringmouthpiecereview.org/snorerx or https://snoringmouthpiecereview.org/vitalsleep may be your best bet to overcome the perils of sleep apnea.